The chapter is short, but so packed full with reference. Also… I completely don’t have any idea where the Zenpoko-kun’s Song came from. This might sound sudden, but in a certain city in the Saitama Prefecture where I lived in previously, there was another yuru-chara or local mascot character other than 『Musashi Boy-kun』. Its name was 『Zenpoko-kun』. It was a mascot character that was designed based off a zenpoukouenfun or keyhole-shaped tumulus. This 『Zenpoko-kun』 appearance was simply that of a keyhole-shaped tumulus with hands and feet sticking out. Even though it’s a mascot character (yuru-chara), the design was too laid-back. Well, that’s just like what my hometown will do, after all, they already created 『Musashi Boy-kun』 when my hometown didn’t have any connections with Benkei and only because it used to be called as Musashi Province in the past. However, there was a reason behind this laid-back design. Within the city, there was a keyhole-shaped tumulus, but it had long been called the 『Twin Mounds』 by the locals. It was originally considered not as a keyhole-shaped tumulus, but two small tumuli that wer built side by side. For this reason, when the idea of “let’s create a mascot character to promote these Twin Mounds”, the mascot character design was originally a boy and a girl duo wearing clothing from the Kofun period. However, when this design was completed, there was a land survey conducted that confirmed that the Twin Mounds was in fact a single keyhole-shaped tumulus. 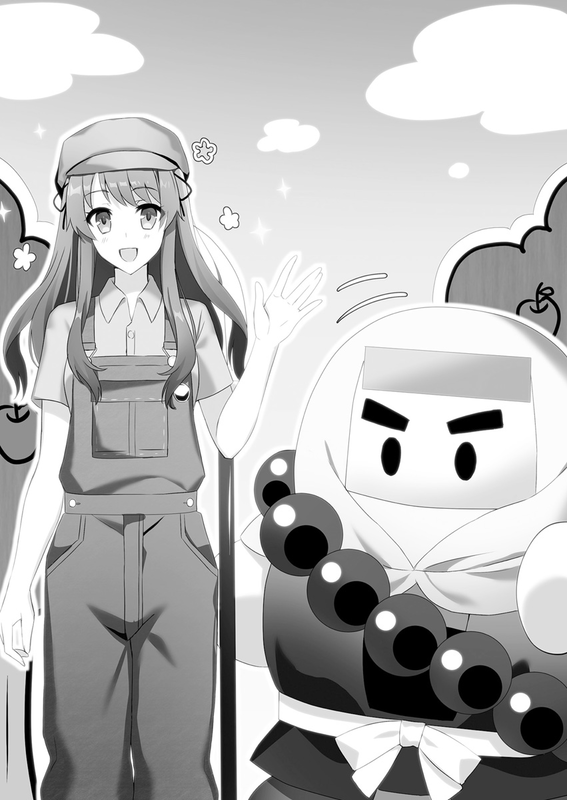 The manufacture of the mascot character had already been decided. The budget had also already been passed. However, the Twin Mounds was not two tumuli, but a single keyhole shaped tumulus. Fortunately, only the design of the twin mascot had been finished, and it hadn’t yet reached the phase where it was manufactured or the costume itself or merchandise had been ordered. That’s why they immediately redesigned the mascot character as a keyhole-shaped tumulus. Because of this public office way of thinking, it resulted in the sudden birth of 『Zenpoko-kun』. However, although the problem of the budget and ordering of materials was cleared, this improvised lackadaisical solution was so unattractive that it was not that popular among the citizens. That 『Zenpoko-kun』 was right now being projected onto the Royal Voice Broadcast in the Friedonia Kingdom. It was 4 o’clock in the afternoon on Month 1 Day 10, when the New Year’s Fever had died down. The audience, that gathered due to the King performing yet another broadcast, was taken aback at the sudden appearance of this mysterious lifeform (?). Unaffected by the audience’s confusion, the Zenpoko-kun inside the projection spoke out loudly. After Zenpoko-kun finished saying this, a laidback melody began to play. Standing in a place that wouldn’t be picked up by the broadcast equipment, Liscia who was looking at the scene together with me, was gaping her mouth wide open and had an astonished expression on her face. Yeah, that was the truth. Since there was no recording equipment, we couldn’t perform a dubbing, so there was no other option beside making the voice come from Zenpoko-kun itself. Its movements were due to my skill manipulation as Pamyu wasn’t that heavy, but its insides seemed to be humid so she threw complaints at me. After the laidback song was over, what projected next was a scene of a stage. On the stage, there were 『props』 of trees, grass, and stumps arranged to represent a clearing inside a forest, where Zenpoko-kun was writing something on the ground with the chalk in its hand. Zenpoko-kun said while looking troubled. Then, a blue-haired onee-san, who looked rather boyish with a hat, shirt and short pants, happened to pass by. The blue-haired onee-san noticed Zenpoko-kun and then made a wide smile as she began to talk with it. 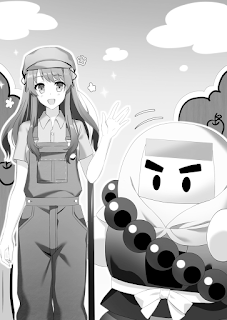 Zenpoko-kun raised its face and then walked stodgily towards the onee-san. At this point, the adults in the audiences realized that this onee-san was the famous 『Supreme(Prima) Songstress(Lorelei)』, Juna Dohma-dono. Since when fans were talking about Juna, her appearance in her usual elegant and expensive dress had a strong impression, so they didn’t noticed her in her current boyish outfit. Her way of talking and atmosphere had become plainer. Right now, Juna had lost her charming older female persona, and she now displayed the loveliness of a girl of her age. Zenpoko-kun then consulted with Juna onee-san. Many people in the audience nodded at this statement from Zenpoko-kun. Several days earlier, King Souma had encouraged the citizens to study reading, writing, and calculation. However, 「Reading and writing, I could understand, but why do we have to learn to calculate when we are not even merchants?」 Calculation was something that was normally unrelated to their lives, or so they thought. However, Juna onee-san, winked at Zenpoko-kun who was speaking the opinion of the audience. Juna onee-san declared this to Zenpoko-kun who looked doubtful. Then out of nowhere, a happy bright melody began to play. Juna onee-san then began to sing along with this melody. The song was 『Fun Arithmetic』. A song from 『Everyone's Songs』 that Souma had taught to her. This song that the Singing Onii-san, Tanaka Seiji-san, who was famous from 『Beautiful Sunday』, had sang. The song lyrics were about adding and subtracting, the changes when multiplying by ten, and that no matter how big the number is, it will disappear when multiplied with 0 in several comical real world events. Juna onee-san and Zenpoko-kun were singing in a circle, their dancing figures looked extremely fun. After the song had finished, Zenpoko-kun flapped his hands happily. Liscia, who was watching the broadcast, muttered so. Liscia looked at me with disapproving eyes. She might be thinking that I was ridiculing her. As expected from a Royalty who had received proper education, Liscia answered it smoothly. I didn’t know how high the level of mathematics was in this world, but perhaps Liscia had a better mathematics knowledge of mathematics than me, who was just a Social Science student. By the way, I would lost majorly to Roroa. This girl seems to be an expert at the abacus, to the point where she could nonchalantly perform mental arithmetics up to 10 digits. What Juna-san was singing was the 『Song of π』 with lyrics added onto it. My high school music teacher was a funny one, and I heard this 『Song of π』 that he arranged himself. The arrangement method…… Or rather, the pauses inside this 『Song of π』 gave it a strong impression. Liscia was astonished by it. Liscia smiled teasingly at me, so I lightly hit her head in retaliation. It the author speaks about the NHK educational program, then it will be a lengthy story. I could write about how I like the age of 「Ten・Ai・Prism Access!」, or if I asked about NHK education anime, then rather than Nadia or Sakura, I would say the Tensai Television Trilogy 「Dinosaur」, 「Gene」, and 「Nano」, I could talk about this endlessly…… Yup, if I write about these things, then this story could be said as to be reeking with an Ossan’s stench…… I still have a self-awareness. In case you are wondering, there is song of P in pentatonic or in Major Scale at Youtube. https://en.wikipedia.org/wiki/Yuru-chara Different from normal costumed character. A yuru chara must be “yuru”, so either they are dopey, look stupid, or ridiculous. Originally: yuruchara and yurusugiru. Don’t know how to make the pun work in English. The Kofun period (古墳時代 Kofun jidai) is an era in the history of Japan from around 250 to 538 AD. It follows the Yayoi period. The word kofun is Japanese for the type of burial mounds dating from this era. The Kofun and the subsequent Asuka periods are sometimes referred to collectively as the Yamato period. The Kofun period is the earliest era of recorded history in Japan. It’s a spoof of Okaasan to Issho (With Mother) a long running children's television program airing weekday mornings in Japan on NHK, much like The BBC's Watch with Mother, that had been airing since 5 October 1959. Minna no Uta (みんなのうた), literally Everyone's Songs (English title: Songs for Everyone), is a five-minute NHK TV and radio program which is broadcast several times daily. The program started on April 3, 1961. It is one of NHK's long-running programs. うたってあそぼ (Utatte asobo). A Saturday segment from ともだちいっぱい / Tomodachi Ippai (A Lot of Friend) a children’s show that aired on NHK from April 1990 to March 1995. It’s a character from the Fun with Nature and Fun with Song segment. Hotch Potch Station (ハッチポッチステーション) is a NHK children show that was shown from 1995 to 2005. Related to ひとりでできるもん segment 天ちゃん・恋ちゃん (1994). Still can’t find what the hell is Prism Access. 恐竜惑星Dinosaur Planet. An NHK anime from 1993. ジーンダイバー Gene Diver. An NHK anime from 1994. 救命戦士ナノセイバー Lifesaving Soldier: Nano Saver. An NHK anime from 1997. Royal succession is serious business. Rivers of blood have been shed and countries extinguished over it. Bang Liscia now you HETARE !1!1!1!1!1! Also i really should go back to studying... is there a song to help me? Quite educational. Thanks for the chapter.